Full Super Cat Speed ahead! 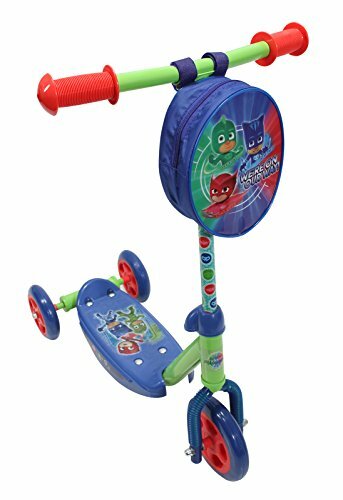 The PJ Masks 3-Wheel Scooter from Playwheels is a great way for beginners to get around! The triangular configuration of the 3-wheeled scooter allows for easy balance and maneuverability - a perfect design for young children who are ready to roll like the big kids but are still mastering their motor skills. The wide plastic deck has a special grip footplate for added safety and balance, and the steel stem, handlebars, and frame offer the sturdiest support. The large, smooth-rolling urethane wheels provide an even ride on any surface while being lightweight enough for kids to use their dominant foot to slow, steer, and quickly and easily stop the scooter. The scooter comes with a detachable storage pouch on the front that features vibrant, colorful graphics that kids will love - it's great for holding a drink or your child's favorite toys! With this fun scooter, you won't have any trouble getting a kid outside for fun and exercise on a nice day! Recommended for ages 3 years and up, and supports up to 45 pounds. If you have any questions about this product by PlayWheels, contact us by completing and submitting the form below. If you are looking for a specif part number, please include it with your message.